The Brodhead Cardinals (5-6 overall, 2-6 Rock Valley) girls basketball team dominated a hot Parkview Vikings (4-6 overall, 4-0 Trailways South) 57-32 in a non-conference matchup last Thursday. 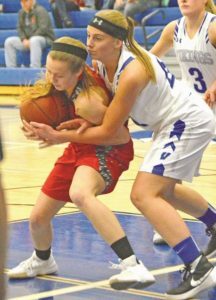 The Vikings came into the game with a four-game Trailways South winning streak. Cardinals’ junior Alexis Oliver came out sizzling hot, nailing her first four threes to propel the Cardinals to a 21-5 lead eight minutes in. Oliver scored 16 of the Cardinals first 21 points to set the tone. Brodhead got whatever shot they wanted for the majority of the game. Sophomore Carisa Purdue knocked down a three off a ball reversal during the early surge.